Written by Richard Murphet, “Quick Death” was premiered under the title “Quick Death to Infinity”, at La Mama, Melbourne, in the season Artaud and Cruelty in 1981. It is a physical text consisting of 51 scenes, some as long as 3 minutes, some as short as 3 seconds. 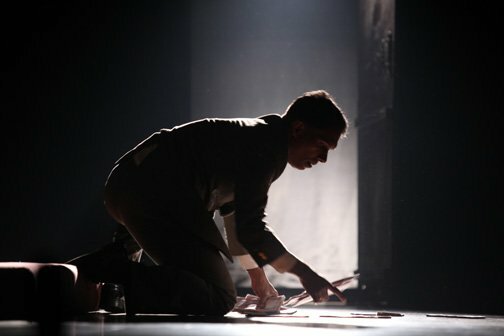 The message, the plot, the narrative of this performance score manifests in its actions and images. The two men and one woman who inhabit the play are caught on the roller coaster of the action. The relationship of action to words in “Quick Death” is intriguing – only in one scene does someone we see also speak. The overlaid voiceovers open up a space between action and words which allows a multiplicity of interpretations by an audience. The logic of cause and effect is not central in Murphet’s writing, rather a network of associations and forces. Richard Murphet has a maelstrom of a long career in contemporary performance. Starting his active work in the 70s with the Nightshift at the APG, he was the artistic director of the Mill Theatre in Geelong through the mid 80s. Later on the in the 90s he took on as the head of theatre making at the prestigious Victorian College of Arts, Melbourne. Some of his notable writings are Quick Death (Melbourne 1981, Sydney 1982, Singapore 1994 & 1997), Slow Love (Melbourne 1983, Sydney 1985, Los Angeles Dramalog Award for Best Play, Belgium 1999), Frankenstein’s Shadow (Canberra 1991, Sydney 1991), and Dolores in Department store (Handspan Visual Theatre, Creative development, Melbourne, 1998). Sankar Venkateswaran, the artistic director of Theatre Roots & Wing, completed Theatre Training and Research Programme (TTRP), in Singapore. He has worked with various eminent theatre artists across India and abroad as a director, actor and music composer. His major appearances include Performing Women, which is an international theatre collaboration project organized by Japan Foundation (New Delhi, 2007), Centaurs (dir. Anuradha Kapur, Nairobi, 2007) and The Singapore Beckett Project (dir. Phillip Zarrilli, Patricia Boyette, Singapore, 2006). His workshop, “Rhythm- Acting” was invited by Kuna’uka Theatre Company in Tokyo, Japan. Theatre Roots & Wings (theatreraw) is an actor’s collective, working in a laboratory context striving to achieve better heights in Acting, Actor’s training and Theatre making.